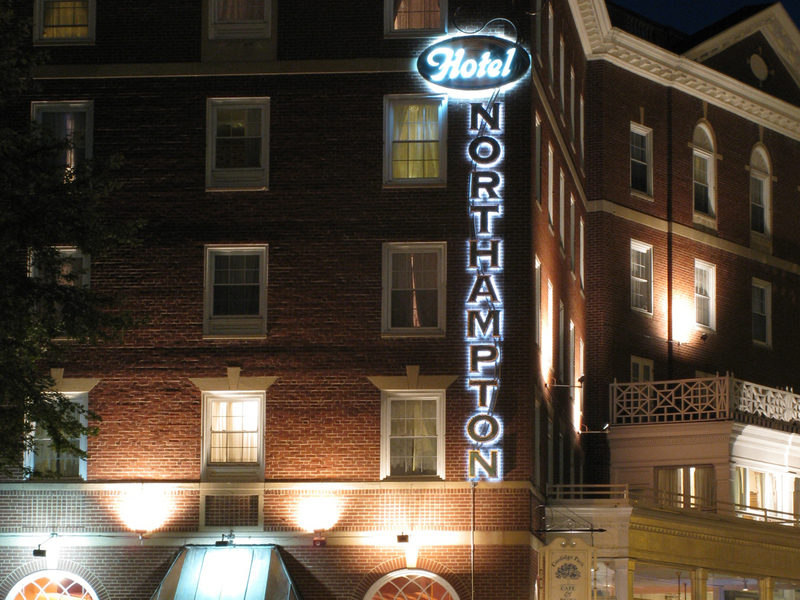 In 2008 Salmon Studios was contacted about designing, fabricating and installing a new sign for the historic and landmark Hotel Northampton. From the outset our challenge was clear: create a sign sensitive to the hotel’s historic nature while providing a refreshing contemporary edge. We did this through the use of 3D backlit stainless steel letters with patina’d copper face plates. 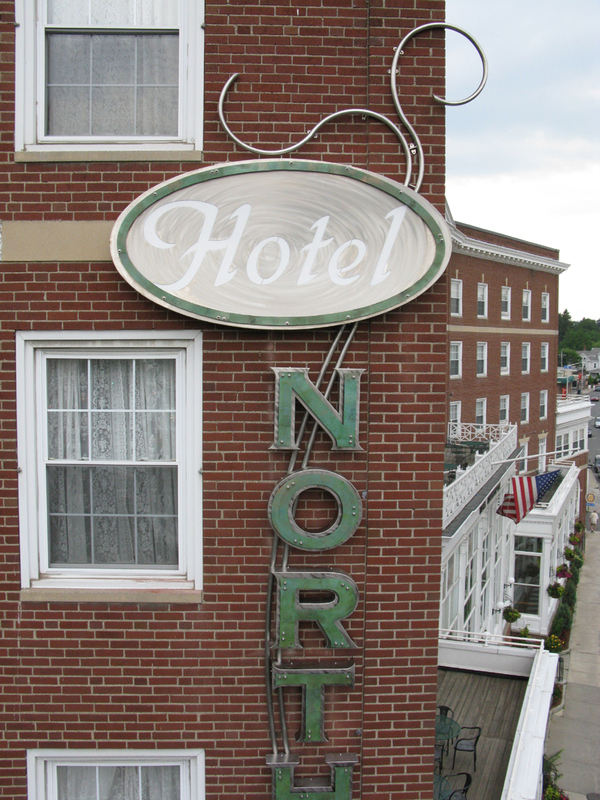 Upon completion and installation of the new sign, the Hotel’s owner together with the Northampton Center for the Arts commissioned a second project to be located on the hotel’s roof directly above the new sign. For more than 20 years the Center for Arts together with the Northampton Chamber of Commerce has organized ‘First Night’ – a city-wide New Year’s party. Following a day of downtown music, activities and fireworks, crowds gather in front of the Hotel Northampton for a midnight countdown as the new years ball is raised atop the Hotel’s roof. By 2009 the original ‘new years ball’ had fallen into disrepair and the Salmon Studio’s team was hired to re-engineer, fabricate and install a larger and more festive ball, complete with removable mast and an elaborate LED lighting and strobe system. 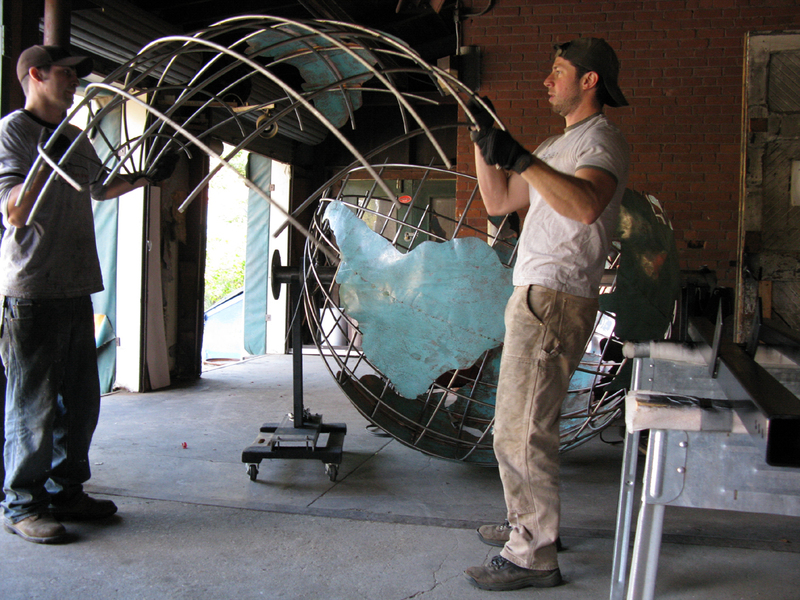 The new ball is more than 6’ in diameter, fabricated from solid stainless steel bar and has patina’d green copper continents. 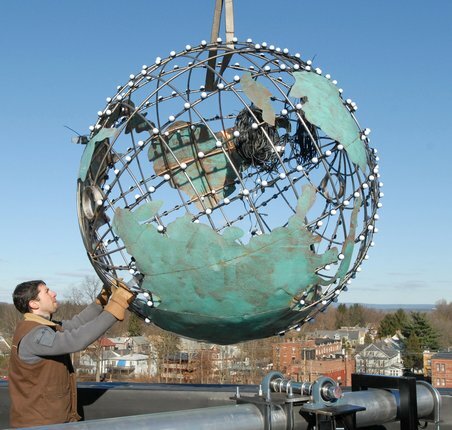 The ball rests on a heavy-duty steel and aluminum frame that allows it to be raised via hand crank and keeps it visible year round.